Panasonic TX-65DX902B review | What Hi-Fi? Panasonic seems very enthusiastic right now. The company has already impressed with its DMP-UB900 UHD Blu-ray player, and is one of the first to launch a flagship 2016 TV. We can’t blame them for getting a bit excited. If you’ve made something good, it stands to reason you’d want to show it off. That’s definitely the case here, because the TX-65DX902B is really good. Panasonic ought to be proud. It can handle 4K Ultra HD resolution and High Dynamic Range (HDR), but the DX902 also meets the stringent criteria for UHD Premium and THX certification. We hook the DX902 to the DMP-UB900, the best consumer picture source available right now, and the DX902 just laps it up. The definition is indeed, ultra high, with all the fine detail you can ask for. We stick on a UHD Blu-ray of The Amazing Spider-Man 2, and it is apparent Dane Dehaan’s hair is a lot greasier than Andrew Garfield’s. Close-ups effortlessly reveal the fine texture of Spidey’s outfit – the webbing pattern and the fabric underneath. Filmmakers are going to have to step it up a bit, because it just became a whole lot easier to spot dodgy makeup and CGI. HDR? Piece of cake. This is a bright panel with excellent local dimming, and contrast is extreme when necessary. Panasonic uses an innovative 'honeycomb' structure to control backlighting. The idea is to confine light to where it is supposed to go, preventing leakage into other areas. This lets the TV to balance deep blacks with bright whites – without one compromising the other. It works. Bright and dark segments are neatly separated, never mixing where they are not supposed to. We watch the scene where Spider-Man fights Electro in Times Square at night: even before it starts, the DX902 does a good job juggling the darkness with light. The chapter begins with a shot of downtown Manhattan, and bright city lights have no problem punching through inky blacks. Darkness in the crowds is capably juxtaposed against the bright billboards overhead. Then the fight starts, and the Panasonic remains composed. Electro’s bolts of lightning can be blindingly bright and yet this does not affect the screen’s ability to illustrate the dark blue uniform of a policeman who’s fallen on the ground. The dynamic range is indeed high, and the picture is more dramatic for it. Do watch those settings. As this panel has a peak brightness of well over a thousand nits – one nit roughly equals the glow of a candle – you really don’t need this thing on maximum brightness in a home setting. With HDR content we reckon you could get away with 80-70 per cent in a bright room, or 60-50 per cent in the dark. We tend to expect nice colours from Panasonic, and we are not disappointed. It certainly helps that Panasonic has again brought in Mike Sowa, the Hollywood colourist who worked on Oblivion, and who was responsible for the tuning the lovely colours on Panasonic’s stunning TX-65CZ952B OLED TV. What you get is lush. The colours are rich, with solidity and a subtlety of shading that gives objects a convincing sense of depth we normally associate only with OLED screens. Skin tones are convincing and people actually look like people. We feel you need a UHD Blu-ray player to make the most of this TV, but don’t consider it compulsory. We were also impressed by its non-HDR performance during a 4K Netflix stream. You lose the wide colour gamut and the contrast, but it’s still a hugely capable picture with impressive sharpness. Then there’s HD content on Blu-ray and on Freeview. This Panasonic is an adept upscaler, adding little noise while doing a good job with colours and contrast. It’s only when we step right down to standard definition content that the picture gets noticeably fuzzy. A note on 3D, if you’re one of its supporters: the DX902 is 3D compatible so you won’t need to throw out your collection of 3D Blu-rays. It uses an active shutter system, but sadly the TV does not ship with the glasses. You’ll have to buy them separately. Unlike its rivals, Panasonic doesn't seem to put much emphasis on the slimness of its TV. 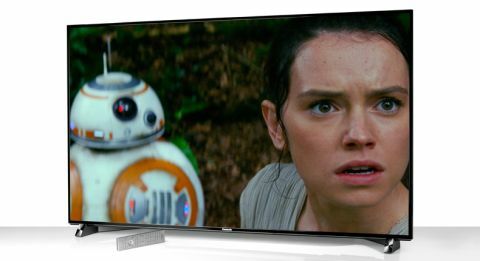 The TX-65DX902B isn't exactly chunky, but it’s not the wafer-thin approach that LG and Sony seem to be going for. This has allowed Panasonic to put some proper speakers in, and as a result the sound is a lot bigger and richer than we tend to expect from TVs these days. This is certainly a smart-looking TV. It’s perhaps not as eye-catching as its rivals, but the bezel is slim and barely distracts from the big screen. Panasonic has always opted for sturdiness over outright aesthetics, and the screen is reassuringly built to a high standard, with a sturdy stand. Curiously, the TV leans back a little on the stand. We didn’t find this to affect the picture quality. Apparently it’s a safety feature, to stop it from tipping forwards – just as well because it weighs a whopping 42.5kg. We’re not so keen on the stand though. Its massive arc shape means you’ll need a bench almost as wide as the TV, which at 145cm is quite hefty. Panasonic seems to be of the opinion that everybody has those long and low racks made by a certain Swedish flat-pack furniture company. As for connectivity, the DX902 is as well equipped as you’d want from a flagship model. You get four HDMI terminals, all ready for 4K at 60/50p with HDCP 2.2. There are also three USB ports (one USB 3.0), an SD card slot and digital optical output. On the software front, Firefox OS makes a welcome return as Panasonic's smart interface. Firefox was one of the more streamlined and well-designed of 2015's interfaces, and made using Panasonic 4K TVs an utter delight. For those who haven’t seen it before, it is a very neat and intuitive operating system. It devices everything into three categories: Live TV, Apps and Devices. It’s hard to get lost in there, and you can ‘pin’ apps and channels you like for quicker access. App support is excellent; you get Amazon Instant Video and Netflix, plus all of the UK’s main catch up apps. Operation is generally swift, although still not as slick as LG’s multi-tasking WebOS offering. Two remotes come in the box: a regular one and a ‘smart’ one that invites you to swipe. It’s one of the least fiddly smart remotes we’ve seen, although we still found ourselves sticking to the traditional wand. The flagship fight has begun, and Panasonic has come out swinging hard. The Panasonic TX-65DX902 is a formidable TV that will be hard to beat, further evidence that the company is making a serious comeback. If you are after a great big TV to do 4K and HDR the justice they deserve, you need to look at this.